Enter the Hybrid Airship. While deceivingly simple, the Hybrid Airship deploys a sophisticated flight control system and a proprietary air cushion landing system (ACLS), enabling safety, affordability and flexibility in accessing remote locations. In fact, with the ability to carry up to 20 tons of cargo and 19 passengers, the possibilities seem endless for the Hybrid Airship: cargo delivery, humanitarian aid, mobile hospitals, eco-tourism and more—all while driving major benefits to environmental and economic sustainability. Rain or snow, hot or cold, calm or blustery, the Hybrid Airship offers day-to-day flying capability to operating sites worldwide. Emissions from commercial transport today account for approximately 1.5 percent of the global carbon dioxide footprint, and are expected to increase as air traffic and trade grows. This is what makes the Hybrid Airship’s tiny environmental footprint so valuable. When it comes to operating in remote locations, several technologies give the Hybrid Airship unmatched capabilities. The Hybrid Airship is non-rigid, with no internal structure providing its shape, and it is heavier than air. Meaning, eighty percent of its lift is generated by helium (and the efficiencies that come with helium), and 20 percent is from the aerodynamic design of the envelope. Perhaps one of the most critical of the Hybrid Airship technologies is the ACLS—three hoverpads that create a cushion of air, allowing it to float along the ground nearly friction free. Then there’s the power. 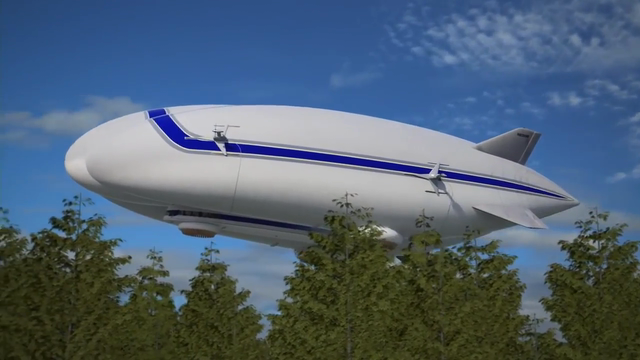 Flying with a 4-liter piston engine (essentially a car engine), the Hybrid Airship uses one-tenth the power of a fixed-wing aircraft, enabling fuel economy, and the engine’s thrust can be vectored up or down to augment lift. Plus, its propellers spin at relatively low revolutions per minute, making it a quiet cargo delivery aircraft. In addition to the sustainability benefits, Boyd believes that Hybrid Airships have humanitarian aid implications as well. The possibilities for the Hybrid Airship are as plentiful as its benefits. And, the program is well on its way to becoming operational as early as 2019, having received Federal Aviation Administration approval on its unique certification plan. “Clearly, this is not your grandfather’s airship,” said Boyd. See more Lockheed Martin Innovation Stories here.